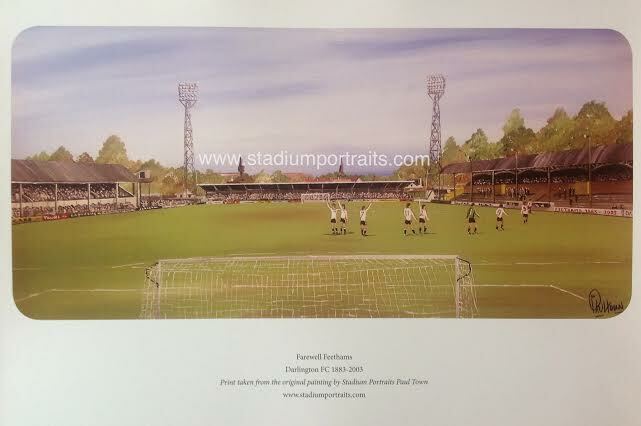 Darlington 'Farewells Feethams' A3 Print. Price includes UK P&P. 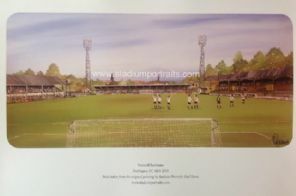 I was commissioned by the committee of the new Darlington Football Club to paint the old Feethams ground they sadly vacated in 2003 to take up residence at their new stadium on the outskirts of town. For me, any team leaving their spiritual home for whatever reason is always a sad occasion. The then chairman, whose name I will not repeat, saw fit to move the club to a brand new identikit stadium with a capacity Darlington's near neighbours, Middlesbrough, would struggle to fill week in week out. At the time with no emotions attached to the club, I for one thought the move was utter madness. Since falling through the trap door of the football league and then going out of business altogether, the fans have founded a phoenix club who are starting out in the lower leagues. There has been some discussion about a return to Feethams one day, as the old place hasn't been developed, but how feasible this is, who knows! Whilst I was painting this piece I could only sympathise with the true fans of the club for not only the loss of their league status, but also a lovely ground. Personally I've only visited Feethams the once, for a night game against Bradford. What first struck me was the idyllic setting in which the ground was positioned. Looking across the lush pitch towards the old main stand, one could sense a small stadium packed with history and emotion. Although Darlington have never been the largest supported club at the lower levels, the fans that turned up to watch their hometown club have a passion and love for the old place. It almost seems like daylight robbery that its now gone. Football has been played at Feethams since 1866, which makes the whole story more hard to take. Entered from Victoria Road, one had a nice walk around the adjacent cricket field before arriving at the football ground. To the left was the main stand with its barrel roof topped off with the old spotlights from bygone years. The pillars which held up the roof were topped off with adorable lattice work which gave the whole structure a touch of class. To the rear of where the stand stood is the River Skerne, and beyond this a tree lined street with Edwardian villas. The home covered terrace was a small enclosure which separation the football from the cricket.This simple covered structure was also pleasing to the eye, and befitting a stadium of this size. Opposite the main stand was the west stand. This structure was based to the centre of the pitch lines, with two small wings of terrace at either side. Although this stands appearance would make any observer feel that it was part of the original build, the stand was actually constructed in 1961. I sincerely hope one day the phoenix club will return to their spiritual home and rise from the ashes of the old. How splendid this would be, however I very much doubt a new build would have the same character as the old. Would the Darlo fans care? No I doubt it very much!